Inside: Parenting a strong-willed child, a sassy kid, or a hormonal tween or teenager can be tricky. 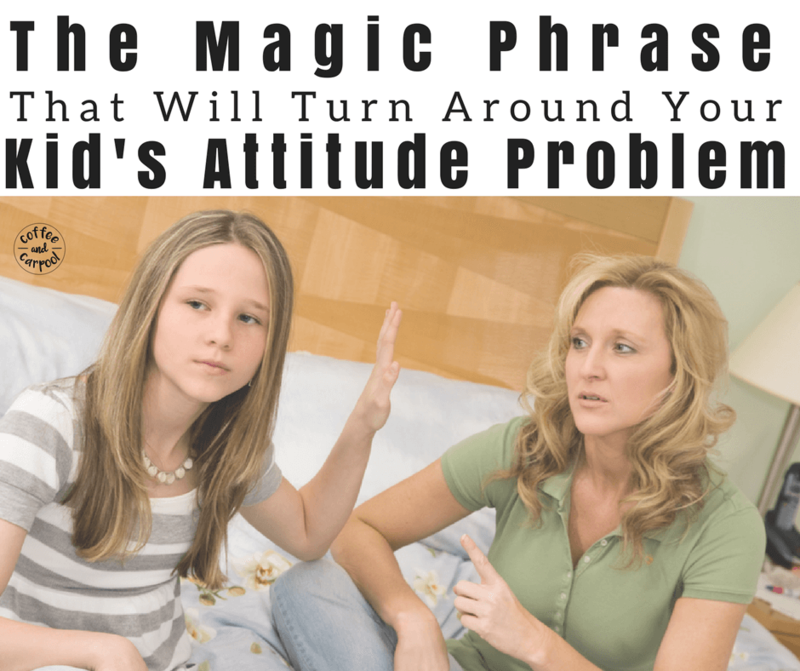 Use this magic phrase to end the power struggles and the nasty attitudes quickly. Noooooo! My tween shrieked at her 6-year-old sister as she chased her through our house. “Give me back my pen,” my eldest yelled as she stomped her foot and balled her fists up in anger. “It’s special.” She spat through clenched teeth. She said it so mean-hearted, my toes curled and I grimaced, Ouch. My six-year-old has a knack for taking things that don’t belong to her. And it pushes her sister’s buttons like no other. And the six-year-old thought it was hysterical because she giggled maniacally as she ran off through the house. This sibling tiff was not going to work itself out. Parental intervention was necessary. So after I caught up with them both, we all calmed down. The prized, special pen was returned. But now it was time for apologies. From both of them. “Sorry,” my tween replied back sourly with a level 10 attitude problem. She couldn’t possibly have been more unsorry. That sorry was the most unsorry sorry in the history of sibling apologies. So, I had a couple of choices. I could give my daughter yet another lecture about how it’s not what you say, it’s how you say it. I could get mad at her and send her to the mirror to practice how to speak to her sister in a polite way. Or I could demand that she follows our #1 family rule and speaks with kindness. I chose door number four and used a magic phrase I say often in my house that turns my kids’ attitude problems around quickly. Like five seconds quick. And this magic phrase ended the squabble and the intensity of their attitude problems almost as fast as it began. Besides the fact that attitudinal comments and sarcasm coming out of my kids’ mouths makes my blood boil, it changes our home’s whole demeanor. When my kids are nasty, the whole house feels nasty. The vibe in our home changes. The way we all talk to each other shifts. And everyone seems to be in a foul mood. So when I hear nasty words, back talk, sarcasm, or “bad” words, I stop it immediately. It’s a fight worth fighting in my house. It’s a battle I choose to pick every time. Because I want a peaceful, kind, loving home. And that takes work since we’re a spicy family. We have big personalities, big desires to have our voices heard, and apparently a huge need to test limits and boundaries. Even during a seemingly innocent and sweet moment. Um, nope. That will not fly. That amount of sass belongs on TV sitcoms and not coming out of the mouth of a six-year-old who still asks to snuggle me every night before bedtime. It had to stop. She had to know that I won’t let her talk to me that way. So I used our magic phrase. And with that, she looked at me and said, “Yes please, Mama,” and we read the book together. That’s it. That’s all it took. Not a lecture. Not a reminder. And not a consequence. She’s testing the boundaries and how far she can push the limits. She’s trying on new roles and new facial expressions and new catchphrases. This course correction takes me mere seconds and doesn’t require me to stop and have long drawn out sit down discussions with each transgression, forgotten word, or rude comment. I need something quick. To the point. And effective. And when we add hormones to the sassy attitude in the form of her older tween sister, I have to come at the problem with a little humor and less emotion. 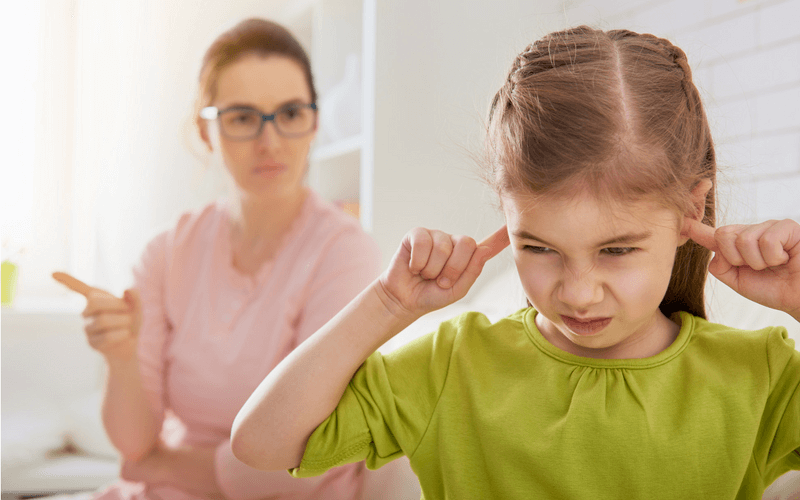 When my tween gets nasty, I usually have to repeat the phrase a couple of times to reset her mood. And I always try to say the phrase, “Try Again,” with as little emotion attached to it as possible. Which can be tricky. Because of course it’s a nasty attitude. Of course it’s rude. Of course it just so happens to be an angry mom trigger point for me. But it’s my job to be the calm one. It’s my job NOT to follow her down the rabbit hole into crazy tween hormone land. So I simply respond to her with “Try Again” until what comes out of her mouth is acceptable or best case scenario -kind- in both her words and her tone. What do you say to your sister for screaming at her like that? Sorrrrry. Level 10 attitude. Try again. Sorry, geez. Level 7 attitude. Try again. I said sorry. Level 8 attitude. Nope, try again. Sorry. Level 4 attitude. Try again. I’m sorry. Level 1 attitude.Try again. I’m sorry (as she giggles because we’ve been at this for far too long and even she knows it), Level 0 attitude. Mission accomplished. Because my mom was right again: It’s not what you say, it’s how you say it that truly matters. 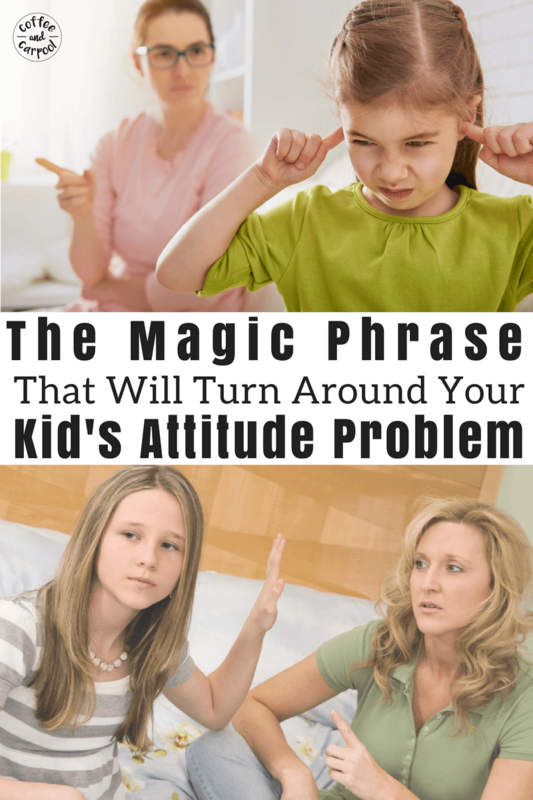 I don’t just use the magic phrase to fix my kids’ attitude problems. I also use it when my kids forget their manners. Works like a charm. I might even give in to the cookie. I also tend to use this phrase when they say words or phrases we don’t use in our house. “Hate” and “even” were just recently been added to our family’s list of “no go” words. I hate this dinner. Try again. I don’t like this dinner. I’m sorry you don’t like it, I think casseroles are delicious. Geez, can you even get me a drink? Try again. Can you get me a drink? Try again. Can you get me a drink, please? Why, yes I can. “Try Again” keeps me calm. It fixes the sass issues, manners issues, and overall rudeness quickly and effectively. And most importantly, it keeps me from yelling at my kids when they start yelling. Now I need to figure out a magic phrase to keep my six-year-old away from my tween daughter’s special pen. “Try again” is great! It’s a “natural consequence” that allows grace, but also creates boundaries. When our daughters were little, we used “rewind” because we still had a VHS player. Of course, that does not work anymore as kids today have no idea what that means! Ha! It is necessary to teach kids about the right attitude in the very beginning when we spot that. “Try Again” is really an amazing phrase to use. Yes! The earlier we teach it the easier it is later! I love this. I’m going to try it! Lately when my 4 1/2 year old starts throwing a tantrum, fighting with his brother or whining, I’ve just been looked at him and taken a deep breath – with the purpose of modeling for him what he should do. I’m finding though that it helps me to stay so much more calm! 🙂 It’s so much better to respond simply than to let our emotions cause the situation to escalate!